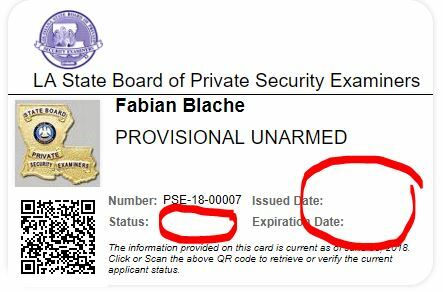 If you hit GENERATE CARD in the eLicensure Portal and do not have a STATUS, ISSUE and EXPIRATION DATE you do not have an issued valid security officer registration. Once issued, the fields will populate and you will receive an email notice alerting you that your VALID card can be generated. So I’m starting a new security company I’m am in the process of segmenting my application so my question is I took the two 8 hr class and the armed class at frc and passed all of them he summit it to you on the portal and said my blue card will come in the mail that was in August so what do I need to do to get my blue card? Unfortunately, the website is not the place for this conversation. Please call the office and choose extension 8. We are happy to assist.